Unfortunately, there are federal regulations that stop a felon from owning a firearm. While that’s true in a traditional sense and a felon can’t go to a local gun store to buy a firearm, there are other types of ways that a felon can arm themselves for hunting or self defense. We’ve previously written how a felon can own a crossbow, but what about a black powder muzzleloader? If you’re interested in getting one for yourself, read on to learn about how you can do so and any restrictions you may face. What Types of Black Powder Firearms Are There? Are Black Powder Pistols Considered Firearms? First, muzzle loading rifles were in common use in the 19th century. This type of gun is one with a matchlock, a flintlock, percussion cap, or similar ignition system and typically manufactured prior to 1898. The Federal Gun Control Law of 1968 bans felons from owning a firearm. However, a gun manufactured before 1898 is considered to be an antique gun. Federal law does not prohibit felons from owning an antique firearm. This is true even for a firearm made as a replica of an antique gun made more recently, as long as it’s not designed for using rim-fire or conventional center-fire ammunition no longer manufactured in the U.S. and not easily available. Any muzzle loading rifle, shotgun, or pistol made to use black powder or black powder substitute and which cannot use fixed ammunition is considered to be an antique firearm. This is unless it incorporates a firearm frame or receiver, is a firearm which has been converted into a muzzleloader, or is a muzzle loading weapon that can be changed to fire fixed ammunition by replacing the barrel, bolt, or breech-lock. The definition of a muzzle loader is very important because if you’re caught with one and it’s determined to be anything but an antique gun, you can be charged with another felony and will likely serve prison time. That said, we highly recommend that you speak with local law enforcement or a lawyer prior to purchasing a black powder rifle to make sure you aren’t violating any laws. Technically speaking, a muzzleloader is considered to be an antique firearm and not a firearm from which felons are banned. Since felons are banned from owning a regular firearm, they are also prohibited from possessing the ammunition for such a gun. However, with it being black powder instead of bullets or cartridges, felons are allowed to possess this type of ammunition as long as they have less than 50 pounds of black powder, and it is intended for sporting, recreational, or cultural purposes. There are muzzle loading guns that are not considered to be an antique because it uses the frame or receiver of a firearm. make sure you keep this in mind prior to purchasing anything. Considering the fact that federal law allows felons to own antique firearms, state or local law may still classify such weapons as firearms which are banned for felons. Again, this is why it’s important to check with local law enforcement, a lawyer, or a State’s Attorney General’s Office before acquiring a muzzle loading gun. If someone is considering purchasing a black powder firearm, it’s important to understand the types of firearms available. Remember, there are always restrictions to these types of weapon for a felon and we advise you to speak with local law enforcement, but below is a list of different types of black powder firearms. A black powder pistol is absolutely considered a firearm, but technically speaking it’s an antique firearm. While felons do have restrictions of owning traditional firearms, antique firearms are an exception to that rule. So, the issue of owning a black powder pistol isn’t a problem on the federal level. That said, the problem lies within the local/state laws. While the federal law may allow a felon to own an antique black powder firearm, it’s possible that the state laws will see this as a problem. DISCLAIMER: It is important to stress that the information in this post is solely for educational and informational purposes, and does not constitute legal advice. While every effort has been made to ensure that the information is correct and current, the law in this area is complex and constantly changing, and readers are cautioned to research and verify it independently at an official source. We highly recommend you speak to legal counsel before moving forward with restoring your rights. 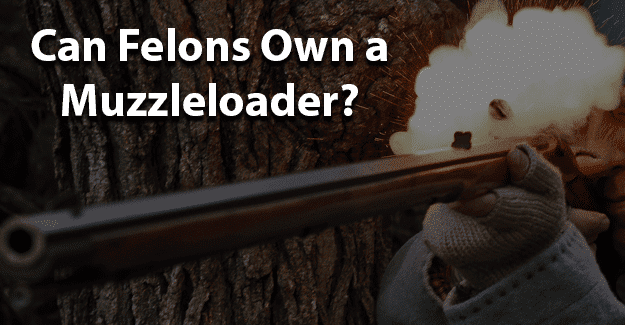 Are you a felon looking to purchase a Muzzleloader? Have you or someone you know been in this situation? What was that like? Please tell us in the comments below. Sounds good just don`t trust law enforcement in Nd and Ne. Long needed , the gun control act of 1968 does not use the word felon ! Don’t have to be a conviction in some cases such as abuse or domestic violence.